A splendid new photo history of northern New Hampshire's White Mountains and Great North Woods. Features more than 200 images from the archives of the White Mountain National Forest. A very good copy of this fine anthology of nearly 40 previously written pieces collectively telling the history of New Hampshire's White Mountains region. Cover has slight imprections, but other book is new and unused. An illustrated early history of hiking in New Hampshire's White Mountains by longtime columnist and guidebook author Mike Dickerman. 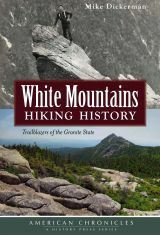 A well-researched and illustrated history of New Hampshire's White Mountains. A handy places names guide and history to the White Mountains of New Hampshire. 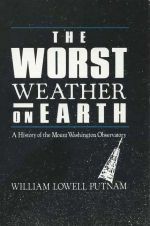 A nice used copy of the definitve hostory of the Mount Washington Observatory. Hard-to-find, used copy of autobiography of well-known northern New Hampshire attorney George F. Morris. A new revised and expanded second edition of the classic history of climbing in the northeastern United States. Authored by Laura and Guy Waterman, along with Michael Wejchert.